U.S. Senator Tina Smith met with retirees in St. Paul about her recent appointment to a congressional super-committee on pension reform. When a Twin Cities-based trucking company abruptly closed three days before Thanksgiving 2016, Tina Smith, then Minnesota’s lieutenant governor, was among the first elected officials to respond. Owners of Lakeville Motor Express, a union employer, had allegedly siphoned off the firm’s resources into a separate, non-union firm. LME drew public ire for failing to pay many of the 95 Teamsters left jobless. 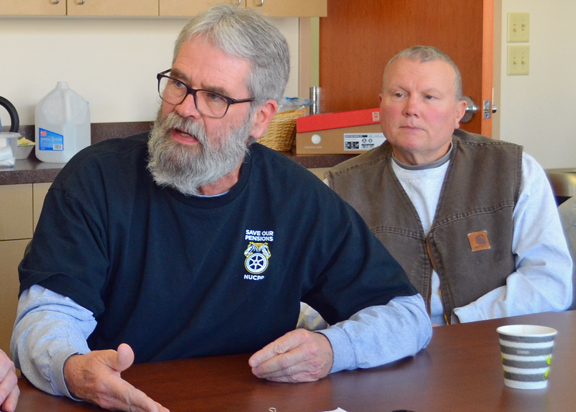 In fact, LME had followed “a roadmap for escaping pension liabilities,” Teamsters Local 120’s Paul Slattery said, that is “bankrupting” multi-employer pension funds nationwide. Nearly 18 months later, Lakeville Motor Express’ owners face a state lawsuit alleging fraud, and Smith, who played a critical role in the Dayton administration’s LME investigation, is taking on the fight to protect working people’s hard-earned pension benefits in the U.S. Senate. The newly appointed senator landed one of eight seats on a congressional “super-committee” formed last month to address the looming pension crisis, as underfunded multi-employer funds providing benefits to over 1 million retirees spiral further toward bankruptcy. The newly formed committee has until Nov. 30 to agree on a plan to address the crisis. Any legislation that advances from the committee is guaranteed a vote on the Senate floor. “This is like getting the rug pulled out from underneath you,” Local 120 retiree Chuck Justice (L) told Smith. 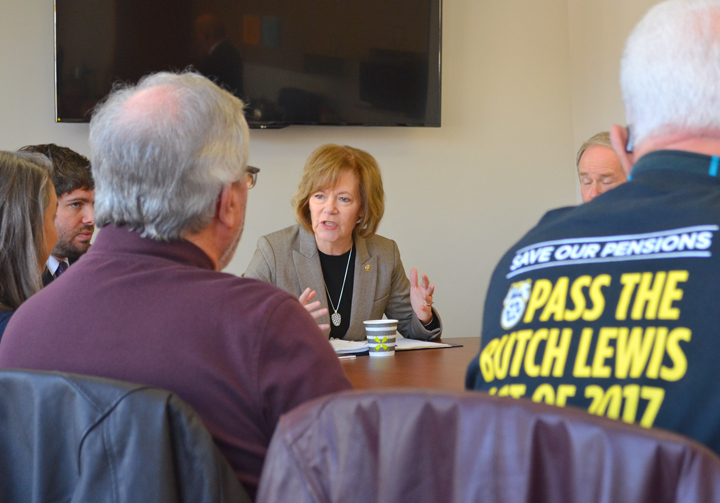 Before digging into the committee’s work, Smith met last week in St. Paul with some of the 22,000 Minnesota retirees covered by the Teamsters’ Central States Pension Fund. It’s the fund Lakeville Motor Express weaseled out of, and it’s on track to run out of money within 10 years. Andrea Hovdestad of Andover attended the meeting with her father, Verlyn, who retired after 35 years as a Teamster driver. She listed the sacrifices her father made to keep contributing to his pension: missing birthday parties, working holidays, sometimes standing on picket lines in the freezing cold. Smith stressed her opposition to cutting current retirees’ benefits as a part of a pension fix. Smith’s preference: the Butch Lewis Act, legislation introduced last year and backed by the Teamsters. The bill would lend cash to Central States and other troubled funds, helping them meet their obligations to current retirees and regain the financial footing necessary to survive over the long haul. Local retiree organization Save Our Pensions-Minnesota mobilized hundreds of people to rally in support of the Butch Lewis Act last December, and Smith’s support for the measure was met with a round of applause from retirees around the table in St. Paul. “If we can figure out a way to bail out Wall Street when they need help, I just can’t believe that we can’t figure out a way to do this,” Smith said, adding that the Butch Lewis Act would be “way less expensive” than the bank bailout. The cost of federal inaction, retirees warned, would be far greater than the cost of shoring up their pension funds. For starters, pension benefits are a major driver of consumer spending. A 2016 report by the nonpartisan National Institute on Retirement Security found that every dollar paid out in benefits supported $2.21 in total economic output nationwide. Many retirees told Smith said they have no “Plan B” if their pension benefits disappear. Dave Erickson, a retired truck driver from Isanti, said 15 percent of his wages – sometimes more – went into the Central States fund, with little left over for individual retirement savings. Without their pensions, many retirees would be left to rely on Social Security retirement benefits, which currently average $1,362 per month – or just over $16,300 annually. Not only would it severely undercut retirees’ standard of living, Central States pensioner Chuck Justice said, it would force many to access public assistance for food, housing and other needs. « Why aren’t more women entering the construction trades?